I’m always a little in awe when I see amazing graffiti murals. They just take so much time and talent that I can’t help but stop and stare most of the time, whether it’s legal graffiti or otherwise. It’s no surprise that this graffiti mural optical illusion caught my eye this morning. I wonder if they had problems with people trying to walk on the graffiti “road”; take note of the orange and white traffic marker. 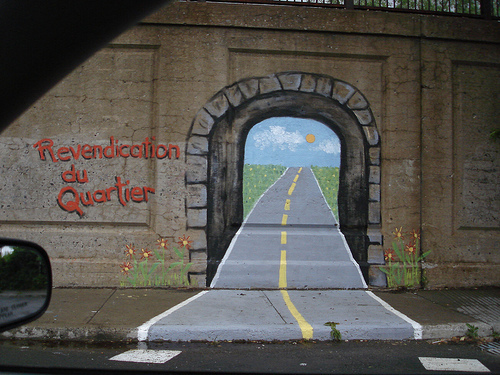 I don’t know much about this graffiti optical illusion, but I don know it’s located in Pointe-Saint-Charles, a neighborhood in Montreal. 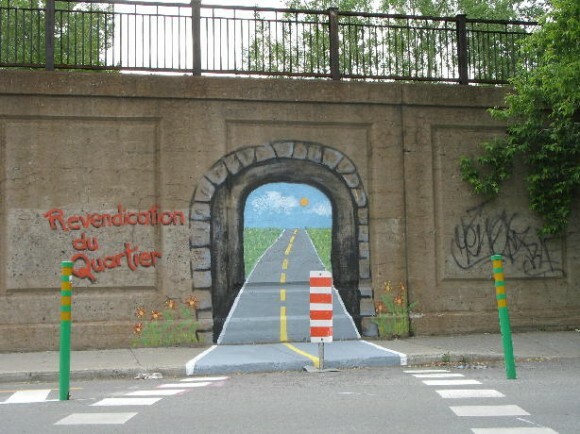 My French is a little rusty these days, but according to this story, this graffiti optical illusion has something to do with making the local bike paths safer. I think? Okay – busted. My French isn’t rusty; I don’t speak French at all and Google translate doesn’t always do the best job. So, if there’s anyone out there that really does speak or read French, maybe you can shed a little light on this subject? I’m really interested in finding out more about this graffiti optical illusion! This graffiti optical illusion really reminds me of something, but I can’t quite ut my finger on it! Roger Rabbit’s Tunnel to Toontown maybe? Or, possibly one of Wile E. Coyote’s amzing creations? What does this graffiti optical illusion remind you of? While you ponder it, check out this awesome moving tunnel optical illusion! kizi | k7x | mario games :Do you believe in miracles in games.